On a cold, rainy night at the Emirates, Arsenal beat Cardiff City 2-1 to go level on points with Chelsea in fourth place. Coming off the back off a disappointing loss to Manchester United in the FA Cup, the Gunners laboured for most of the game but in the end were able to pick up all three points against a spirited Cardiff side. The game was infused with emotion, following the tragic disappearance of Cardiff striker Emiliano Sala and his pilot last week. A touching tribute was paid to both prior to kick-off. The home side enjoyed 70% of the possession but only managed to record four shots on target. The visitors looked dangerous on the counter registering more shots than Arsenal but in the end the Gunners’ quality made the difference. Arsenal were very poor in the first half as they struggled to create chances. Cardiff were unlucky to have missed a couple of good chances themselves. Arsenal lined up in a 4-3-1-2 with Mesut Ozil starting behind the strikers. The midfield trio of Torreira, Elneny and Guendouzi was odd considering the lack of creativity against a relegation-threatened side at home. Arsenal immediately felt the issues of such a conservative midfield, struggling in transitions. Elneny is a very unprogressive midfielder who usually looks for a safe sideways pass rather than a forward one. Starting in place of Xhaka, the Egyptian was hauled off at half time after offering virtually nothing to the Arsenal attack. He frequently dropped between the centre-halves, looking to receive the ball but failed to break the Cardiff lines or progress the ball himself. The absence of Granit Xhaka as a ball progressor meant that Mesut Ozil was forced to drop into deep positions in an attempt to force his side into creating a chance. 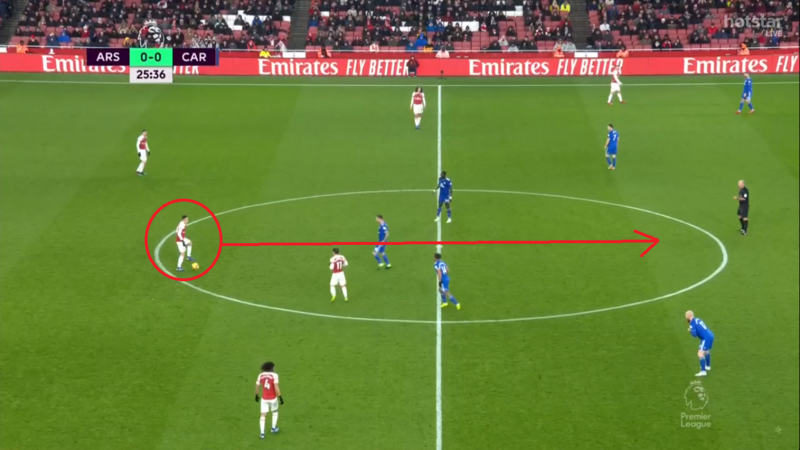 His positional shift meant that Arsenal missed a midfielder positioned between Cardiff’s midfield and defence able to play an incisive pass in the final third. Furthermore, Ozil’s deeper position meant Aubameyang tucked in and was forced centrally, rendering him unable to provide the width that the home side required. 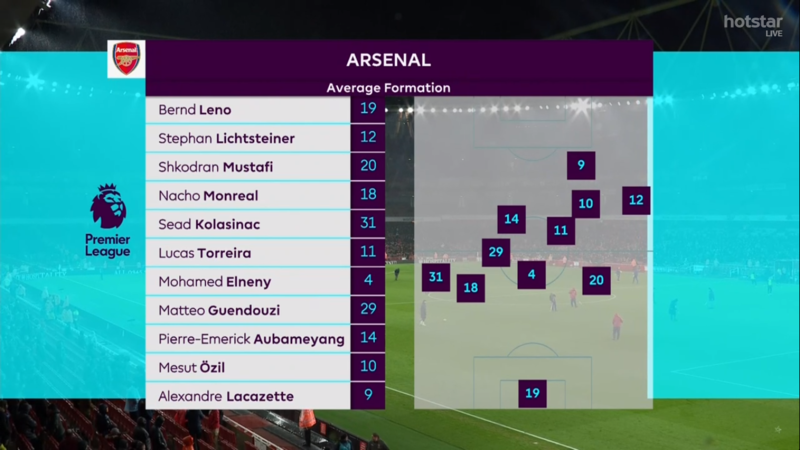 With Lichtsteiner playing at right-back, the Gunners were devoid of any sort of attacking impetus from the right flank. Elneny drops deep to receive the ball. However, unlike Xhaka, the Egyptian does not have the passing range or positive approach to act as a successful component in transitions. 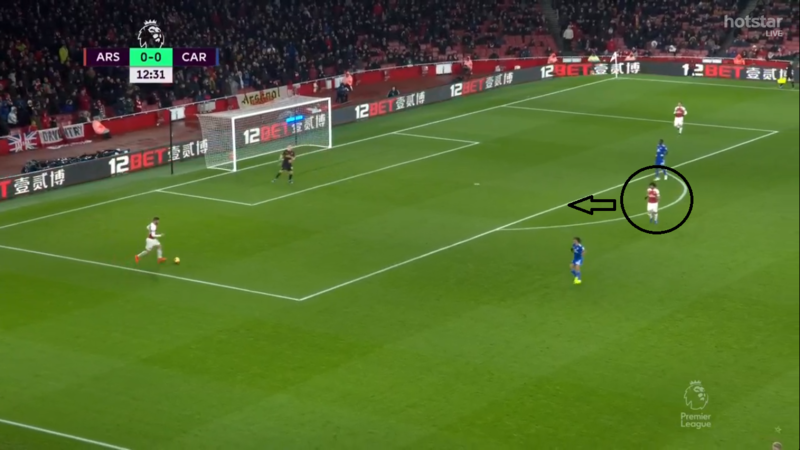 Mesut Ozil (circled) is forced to drop into his own half in an attempt to bring the ball out of the defence and actually offer something in attack. The image indicates the lack of any sort of cohesion in the Arsenal side. With players all over the place, Arsenal really struggled in the first half. Cardiff, on the other hand, put up a credible performance, especially in the first half. Neil Warnock praised his side’s performance as the best of their season and it was easy to see why. The Bluebirds lined up in a 4-4-1-1 and had a clear game plan to execute. 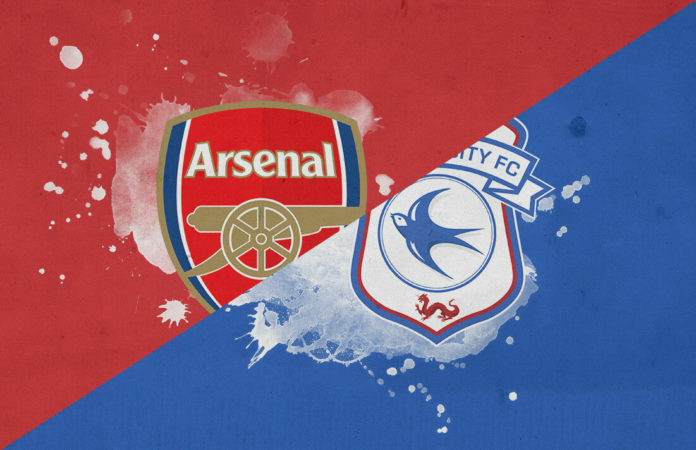 Positioning themselves narrowly, Cardiff were able to handle any Arsenal attack with ease, pressing Arsenal in their transition from defence to attack but then sitting deep when Arsenal had the ball in the Cardiff half. The visitors relied on the counter-attack for their chances and could very easily have scored twice in the first half. Bobby Reid was particularly impressive, using his physicality to win aerial duels and act as a target man when Cardiff launched the ball forward. Understandably, the visitors tired out in the second half but it was a spirited performance nonetheless. Arsenal went into the second half swapping Elneny for Iwobi in an attempt to actually threaten the Cardiff defence. Elneny’s removal did nothing to alleviate Ozil’s positional issues but at least meant that Arsenal could utilise the width of the pitch. Iwobi’s link with Kolasinac created the first goal. The Nigerian threaded a pass between the Cardiff defence for Kolasinac to meet, a route Arsenal have been heavily reliant on this season. The Bosnian was fouled in the box and Aubameyang dispatched the penalty that followed. Given his immediate impact, one could question why Emery had not started with Iwobi and had instead opted for such a conservative midfield in the first place. With a 1-0 lead, the home side were satisfied with keeping the ball and not being too adventurous. The second goal was largely down to the individual skill of Lacazette rather than a significant effort from Arsenal. However, the home side at least showed a willingness to attack rather than passing the ball sideways endlessly as seen in the first half. Unai Emery has had significant injury issues to deal with but it’s still worrying how Arsenal aren’t developing an identity in terms of their style of play. The Spaniard’s team selection mistakes are also costing the Gunners from time to time. It’s easy to forget that Matteo Guendouzi arrived just six months ago from the French second division given how comfortable the youngster looks at Premier League level. Against Cardiff, Guendouzi was one of the few Arsenal players who actually played well. 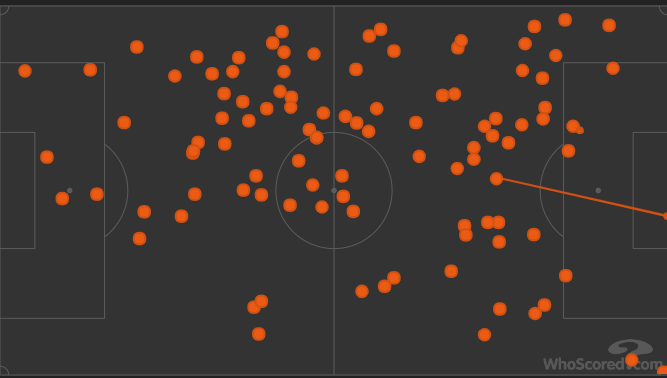 The Frenchman made 83 passes, the highest for his side, had 102 touches and made three dribbles. His tactical role in the side is quite curious as well. Far from being simply a defensive midfielder, Guendouzi is literally all over the place. However, he rarely shows up in the opponent’s penalty box as a box-to-box midfielder would. 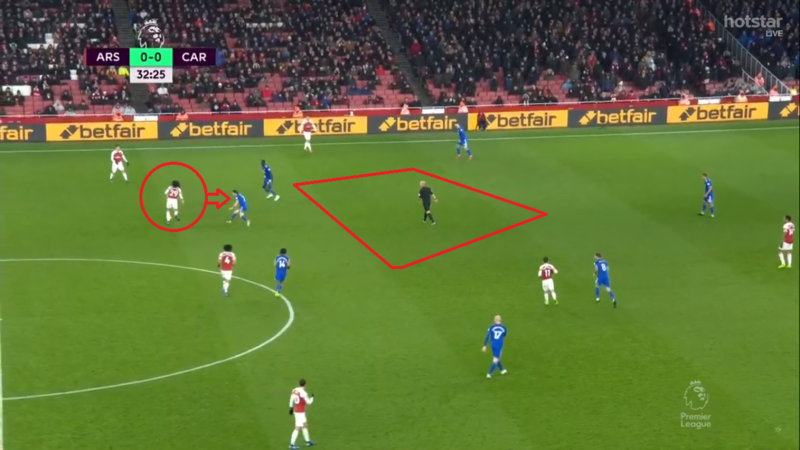 Frequently dropping deeper to receive the ball, Guendouzi doesn’t pass much but rather opts to dribble his way into the opponent’s half and into more attacking positions. His ability to invite and evade pressure is similar to ex-Spurs midfielder Mousa Dembele. The youngster has a great ability to play a pass between the smallest of gaps in the opposition defence. This is a valuable asset considering how reliant Arsenal are on width from the full-backs. 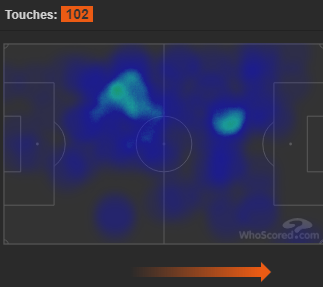 With touches all over the pitch, the graphic indicates how Guendouzi put in a great performance, covering distance, tracking back and initiating attacks for his side. While displaying far from exciting football, Arsenal recorded an important win in terms of staying in the race for the top four. The result, however, does not hide the fact that the Gunners were quite poor against Cardiff. Emery’s side travel to Manchester City on Sunday and will need to be at their best to even stand a chance of getting a result. Neil Warnock’s Cardiff will be disappointed they couldn’t take anything away from the match despite their fighting performance. With games against Bournemouth and Southampton on the horizon, Cardiff can take heart from their performance at the Emirates and look to secure positive results against teams in the lower half of the table.